All of our Harpsicle®, Sharpsicle™, Flatsicle™, Fullsicle™, Grand Harpsicle® and Brilliant™ Harpsicle® Harps are built using maple as the hardwood. Special Edition Fullsicle™ Harps are made with either cherry or walnut. Before going further it is important to clear-up a common misconception. Among many stringed instrument musicians (acoustic guitarists in particular) there is an almost cult-like belief that the wood chosen for an instrument accounts for the majority of the voice of the instrument. Everywhere these musicians talk with one another you will hear things like, “Walnut has such a bright voice,” or, “spruce sounds very clean,” or “cherry is so warm.” Let’s be extremely clear - yes, wood matters but in the overall scheme of things it is the design and quality of craft matter much, much more. Which lutherie builds your harp absolutely dwarfs all other considerations. Along those same lines, when you hear someone say, “cherry sounds so warm,” you need to remember that every single tree of every single species is unique. Any given piece of cherry lumber will have a variation in the cellular structure (this is what creates voice) not only based upon different trees but based upon different parts of the same tree. The easiest way to understand this is by imagining a tree that is growing on a steep mountain. The cellular structure on the uphill side of the tree will be quite different than that of the downhill side because the tree is working to grow straight up. So yes, wood matters but it is wise to keep it in perspective. 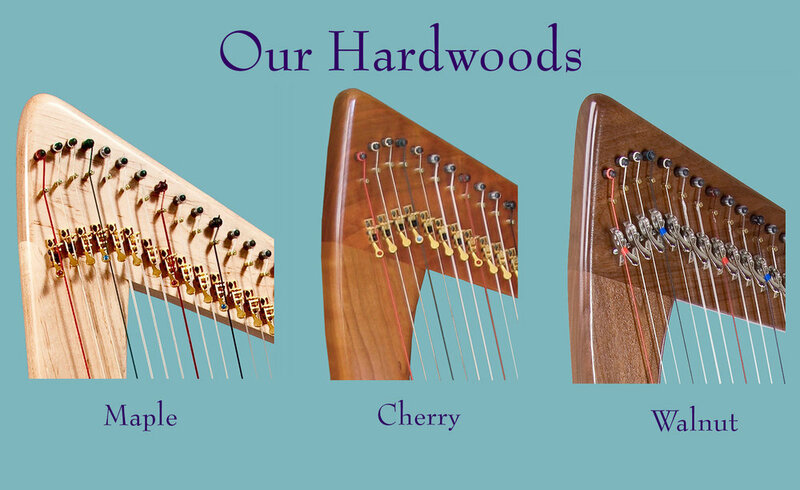 In lever harps, hardwoods comprise all but the soundboard itself and the primary job of these woods is to provide mechanical strength and structure. Additionally, if the back of a harp is properly designed, it will work in concert with the soundboard to amplify and augment the frequency pushed off the inner back of the soundboard. The one caveat is that any of our brand new harps sound brighter than it will after the strings settle and the soundboard rises. (See About Soundboards.) We think of it as our job to be certain that every single harp we build sounds great for its entire life. We select our woods accordingly.